Arcadium is like two amusement parks in one. You can spend time at our classic roller coasters, or if you to cool down, walk down to the Arcadium water park. The water park boasts some of the top water rides in the south. You can choose to purchase a gold ticket for any fifteen rides, a plantium ticket for twenty rides, or for the best value, the full-day pass to ride as many times as you want. The Big Dipper: Test your nerves with this classic water slide - from 10 stories above Arcadium. The Blackhole: A four-slide complex complete with special effects and waterfalls. You'll be sure to leave this black hole afraid of the dark. 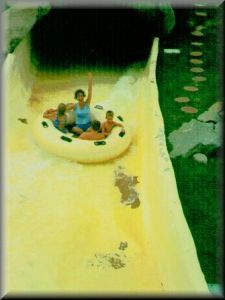 Flash Flood: Grab 10 of your friends and hope for the best in this water slide, as your huge boat drops out of sight, creating a mammoth wave at the bottom. Swoosh: Gather the gang in a mammoth tube, and shoot over 3 drop-offs in this 500-foot ride. Hold on tight, because this ride is fast. The Lazy River: Ready to relax? Grab a tube and tour Arcadium along this carefree waterway. The Wavepool: Try one of our two wave pools, with big waves every fifteen minutes. So grab your suit, your towel, and join us at the Arcadium water park.